Plumb Beach is to Brooklyn what Essaouira is to Morocco: an internationally recognized windsurfing spot. But let's not forget that we're in Brooklyn, where our beloved Plumb Beach has been referred to as "that parking lot on the Belt Parkway, just east of Exit 9 Knapp Street." Once you cross the other side of that parking lot, you'll find a small, , clean khaki-color sand beach with grasses and flowers peaking through the sand. Plumb Beach is part of the Gateway National Recreation Area. Its also ground zero for an armada of windsurfers and kiteboarders, who take advantage of the strong breezes in the Rockaway Inlet, not to mention the easy launch access (easily accessible off the Belt Pkway, parking, short walk to the beach). 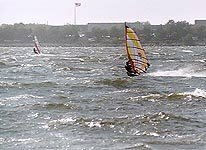 When winds are between 11 and 16 knots, experienced windsurfers and kiteboarders fly on the waters at incredible speed. We don't windsurf of kiteboard, but we love watching them, particularly the kiteboarders. And because we figure you want to know, "Is it really clean to go in those waters?" We've never heard of anyone getting sick from swimming, sailing, diving, windsurfing -- you get the picture -- from being in the water. Plum Beach, wasn't always Plumb Beach. It was Plumb Island -- an island where people lived in bungalows. That all changed in 1940 when Robert Moses filled in the island to connect it to the rest of Brooklyn in order to build the Belt Parkway (Moses really loved highways). Today Gateway National Recreation Area manages the beach area but the parking lot is still owned by New York City. 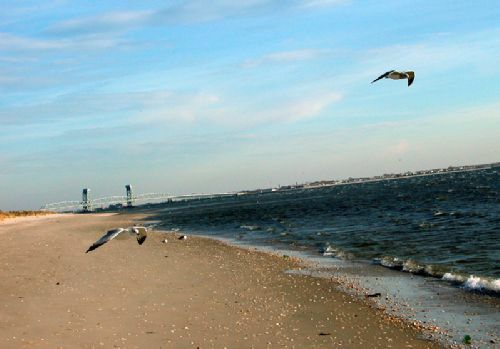 In addition to being a great spot to launch a windsurfer or kayak, Plumb Beach is great for sunbathing, running and checking out the Herons, Egrets, horseshoe crabs and other wildlife. It also has an amazing view of the Rockaway Inlet and Breezy Point. The New York Times recently published a story about Plumb Beach (they spelled it Plum. Who is corrrect?) being transformed into a "performance art-bar." Clever idea, considering seamen's affinity for rum. what the hell, are you out of your mind? THAT BEACH IS DISGUSTING. Just discovered Plumb beach while exercising the Border Collies a bit. Do you know where to perhaps tape kite boarding or wind surfing lessons around the boroughs? I'm in middle village Queens. I used to hang out on Plum (or Bum) Beach for years as a teenager living in Sheepshead Bay. One day I happened to stumble upon the graffiti overpass, it was such a barren, yet beautiful place. I wasn't out of my mind to think so. That beach was disguisting but it was my sanctuary. Thank you for the story. Hey, nice description of the beach. I especially like the title. I windsurf there and it really is a paradise for windsurfers and kite surfers. However, it is not as pretty as you describe it, especially recently since there is practically no beach left. The water almost reaches the bike trail. Soon I think it is going to flood the highway. I've been going to Plum Beach ever since I was a kid, and I can answer the spelling question. It's definitely P-L-U-M because the beach is named after the beach plums that grow there. My family used to pick them and make pies: tart but yummy. Plum Beach is polluted, but it's also a great place to see a live salt marsh. I believe the spelling is Plum not Plumb. The beach is actually nice, i got a chance to visit it last month, I think it's a fine location! Hi there, I'm in Brooklyn for a few days and would love to go windsurfing. Plum Beach sounds like an option. Is there a gear rental place anywhere nearby? Anywhere in the region? Thank You for our First Successful Month! Top-Siders Hit the Runways. Seriously.